TT star and much-loved biking celeb admits his racing future is uncertain after a massive crash – now a new book reveals how he tackled tough times in the past. uy Martin is at a crossroads. In his life and in his racing career. Following a bad accident at the Ulster GP, he is fighting to recover from terrible injuries (see page 21) and thinking about his future. It’s not the first time he’s been faced with tough decisions. A new book, by Phil Wain looks at the ‘difficult years’. There’s an old saying in racing that “you can stop a fast rider crashing but you can’t make a slow rider go fast” and this was certainly applicable to Guy Martin in 2004. The switch to Uel Duncan Racing and a step up in class didn’t faze him one bit. Duncan provided Guy with an array of machines that would allow him to contest the Superbike, Supersport and, at the International race meetings, the Production class too. Long-time friend Johnny Ellis – or Trellis, as Guy called him – would be his right-hand man, and to prove their commitment to the team they moved camp from Kirmington village to a base in Derry, Northern Ireland for the year ahead. An awful lot of eyes were watching him closely throughout the year – fellow riders, team managers and spectators – but everyone around Guy, particularly the Duncan team, were keen to remind him that this was another learning year and the next step up to the top echelons of the sport. His debut around the TT Mountain Course was eagerly awaited and his performances firmly silenced the remaining critics, finally making them realise what many had been saying all along – that Guy Martin was the real deal. One of the topics talked about the most was whether or not he could become the fastest newcomer in the history of the event – first held in 1907 – and perhaps even break the 120mph barrier. Given that the outright lap record in 2004 stood at 127.29mph and was held by the late David Jefferies, achieving that would be an almost unbelievable feat. The best lap by a circuit newcomer belonged to his close friend Ian Hutchinson. Hutchinson, who would become a fierce rival of Martin’s, showed his potential in 2003 when he won the Newcomers Manx GP with a lap of 116.66mph, on a 600cc Honda. Guy had the advantage of riding a 1000cc machine for his debut, but that shouldn’t detract from what he went on to achieve at that year’s TT. He got off to a flyer with 12th place in the Formula One race, shattering Hutchinson’s lap with a speed of 120.22mph. He went quicker still in the Production 1000cc race but was robbed of his first top 10 finish when he ran out of fuel on the final lap. In the closing Senior race he finished in an amazing seventh place. A final lap of 122.10mph made him the fastest newcomer ever and also, at that time, the 29th fastest rider ever around the 37.73-mile course. It was evidence of how serious he was about his racing and determination to succeed. If a lot was expected of him at the beginning of 2004, then the pressure doubled in 2005. As before, he more than lived up to his billing and delivered results everywhere he rode. Everyone knew he was talented, but this was the year when he needed to step up and challenge for race wins on a regular basis. And he did. National race victories and podiums in Ireland came in abundance and, crucially, he stood on an International race podium for the first time, ending the year with three to his name, including a sensational third place in the Senior TT. His overall performance that week was stunning: he finished all five of his races inside the top six, a feat no other rider achieved. Ironically, the Senior saw him go head to head with Martin Finnegan, the rider who had three more years’ experience around the Mountain Course and for whom Guy had been mechanic for just two years before. Despite suffering from a sore shoulder – the legacy of a trip over the air fencing at the Mill Road Roundabout during the North West 200 Superstock race – he was able to see off his rival. It was mightily close, though. A final lap of 126.48mph made Guy the seventh fastest rider of all time and saw him get the better of Finnegan by just 1.31 seconds after almost two hours of racing. Speaking at the end of the fortnight, he commented: “I really wanted to take a win this year but realised I wasn’t quite ready for it, so to take a podium in only my second year is like a dream come true. With just his dad, Trellis and himself working together, he still maintains that this was one of his most enjoyable and successful years at the TT. It was a tough decision to move to Alistair Flanagan’s team AIM Racing but one that Guy knew he had to make if he wanted to challenge the leading riders. He saw potential in the team, because those involved had plenty of experience. Engine tuner Steve Mellor was highly regarded within the racing circle: with Jack Valentine he had been part of the highly successful V&M partnership for more than a decade, winning numerous TT races as well as British championships. Jim McMahon had been a mechanic for both Honda Britain and TAS Racing, winning International road races also. The Yamaha R1 and R6 machines were certainly up to the job, as were the Dunlop tyres, and the team would benefit greatly from the direct support of Yamaha UK. On paper at least, it looked like Guy would be in an excellent position to challenge the likes of McGuinness and Lougher at Honda and Bruce Anstey at Suzuki. There would also be a new challenge from the man who’d replaced him in Uel Duncan’s team, Australian Cameron Donald. The change in teams also meant a move away from the National road racing scene in Ireland, as he now took part in selected British championship rounds instead. The TT couldn’t have started any better. He was flying during practice week and after some scorching lap times the decision was made to move him up from number 11 to number 1, the main thinking being that the clear track would be an advantage. Guy later admitted that this probably worked against him, although it was mechanical problems that ultimately wrecked his week. His impressive lap times in practice had come despite experiencing small oil leaks and it soon came to light that these hadn’t been resolved as he only got as far as Sulby on the first lap in the opening Superbike race before the engine blew. Things improved with fourth place in the Superstock, but then took another downturn in the Supersport race when a broken steering damper led to a lengthy pit stop and only 12th place. A strong second half of the season led to Guy agreeing to stay with AIM Racing in October. At this point he intended to contest a full season in the British championship along with all the major International road races. However, as has often been the case during his career, no contract had actually been signed and just a few months later he announced he was taking up an offer from Hydrex Honda. The three Internationals, including the Centennial TT, would be at the top of his agenda along with selected British Superbike rounds, while he’d also get his first taste of the Honda CBR1000RR Superbike on which John McGuinness had been so successful on in 2006. Riding the same bike as the current TT master would put him on an equal footing and prove who the best man really was. There could be no excuses this time. Guy’s move to Hydrex Honda was initially considered a risk due to the team’s lack of road racing activities. They had last competed at the TT in 2000 with Scot Iain Duffus, establishing themselves in the British championship paddock. But Shaun Muir, despite never having raced on the roads himself, had a burning desire to win at the TT – and in Guy Martin he saw his ideal rider. Crew chief Mick Shanley was relatively young compared to his peers, but already regarded as one of the best in the business. He’d worked with TT winners Ian Simpson and Jim Moodie in the past as well as spending a number of years in 250cc GP with Jason Vincent. Guy would certainly have the best support both on and off the track. This put him in a great frame of mind going into the Centenary TT: would 2007 be the year he claimed his first win? A couple of problems in practice left him parked by the road, but as the Superbike race blasted off, after a number of delays due to the weather, he was immediately inside the top three. Indeed, he was the only rider to get anywhere close to McGuinness. However, as each lap progressed, so too did the Morecambe man’s lead and Guy had to accept second. As always, he was big enough to admit the better man had won. Another podium, in third place, followed in the Supersport race, as well as a new lap record, which just left the Senior – the Blue Riband race of the meeting and the one they all wanted to win. He again pressurised McGuinness more than anyone and though the HM Plant Honda rider would make history by becoming the first man to lap the Mountain Course at more than 130mph, Guy was only four seconds slower. He came agonisingly close to achieving the milestone himself at 129.816mph. Indeed, television replays would later show that he made a small mistake at Windy Corner and ran wide, and the time lost here was ultimately what cost him. McGuinness increased his lead bit by bit and with a few gearbox problems on the final lap, Guy nursed the machine home for another excellent result. “I was holding John to two or three seconds in the early part, but I lost a lot of time over the Mountain on the run between the Graham Memorial and the Bungalow, I’m crap at all those places. Then on the third lap, the chain started to jump the sprocket, so I was short-shifting everywhere. I didn’t think there was any chance of making it home, but we did. “When Guy came steaming by me at the North West, I had nowhere to go other than the slip road. I was spewing at the time, but when I saw it on TV, it didn’t look that bad, so I was more annoyed with myself than him. There was a lot of stuff said in the papers about it and I’m not sure about some of the comments Guy made. In a year that should have given Guy his first TT win, factors conspired against him and it turned out to be a disastrous year for the now 27-year-old. He suffered all manner of problems both on and off the track, and a series of high profile retirements, most notably at the North West 200 and TT, cost him two Superbike wins. Heading to the TT, Guy didn’t do himself, or his relationship with the team, any favours when he competed in the Pre-TT Classic races at Billown. The team didn’t even know he was there, and what happened could have put him out of the TT, the event for which he was being employed. He crashed out after the battery worked its way loose and jammed into the rear wheel. Again, this was a crash that could have had devastating consequences, because he was fired down the road. Practice for the TT was a lot smoother, although the same couldn’t be said for the opening Superbike race. Starting at number 1, Guy was daydreaming somewhere when he should have been on the grid and he lost almost 10 seconds off the line. It was no surprise to see him down in sixth as the times came through from Glen Helen. He gradually got into his stride and an early retirement from McGuinness meant the race was wide open. By the end of the first lap, he’d taken the lead and with his second lap, 129.540mph, proving to be the fastest of the week, his lead extended to over 10 seconds. Just like the North West 200, though, a probable victory was cruelly taken away from him when, on the approach to Sulby on the fourth lap, a broken crank brought his race to an end. “I can’t even remember what I was doing before the race, but I was arsing about somewhere and I wasn’t ready, so I’ll hold my hands up for that. One minute I was listening to Rage Against the Machine, the next I was heading down Bray Hill, so I just got stuck in. I was only sixth at Glen Helen, but I don’t buy into the thought that you have to be leading there to be in with a chance. He bounced back in Monday’s Superstock race to claim third, his sixth podium, but his bad luck returned in the Supersport race: he only got four miles into the race when the machine expired abruptly. He salvaged a finish with sixth in the second 600cc race, but it was one of his worst ever years at the TT ended with a generator failure in the Senior, just when he was part of a four-rider dice for the lead. 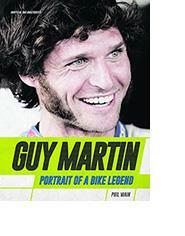 Get Guy Martin: Portrait of a Bike Legend at a special price of £12.99 with free P&P (RRP £14.99) by visiting www.carltonbooks.co.uk and entering promo code MCN1. Valid until end November 2015.